Nike have dropped the vintage BLAZER although for some unknown reason they aren't releasing the dope green colourway in the UK. Come on Nike step it up! 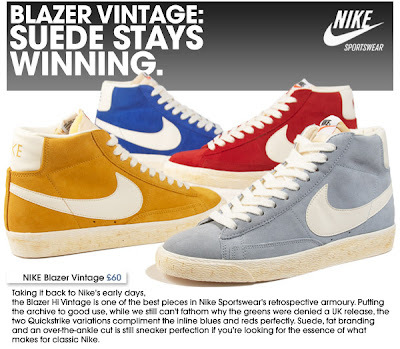 Despite that misdemeanour these other Blazers look fresh and at £60 they ain't gonna break the bank either. Check SIZE? out to order your pair with the fat belly swoosh.